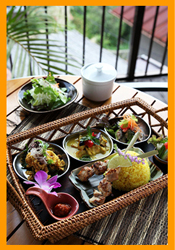 Using air transported spices from Indonesia and local foodstuffs from Nara, Maharajaya brings you Asian ethnic cuisine from authentic Balinese chefs. The restaurant is located alongside the approaching road to Hozanji Temple and is full of a great atmospheric blend of the Far East and Japan. On foot from Hozanji station of Kintetsu cable car.